REGINA, SK – Bushwakker Brewpub has announced the upcoming annual return of a beer brewed in partnership with Parks Canada in honour of a local historic attraction. 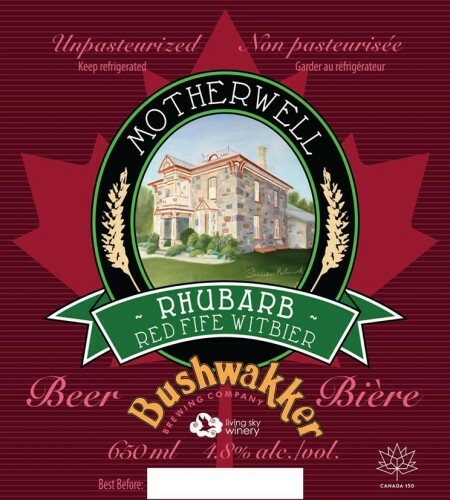 Motherwell Rhubarb Red Fife Witbier (4.8% abv) is named after the Motherwell Homestead, a National Historic Site south of Abernethy, Saskatchewan that preserves the agricultural lifestyle of the early 1900s in commemoration of William Richard Motherwell, a local politician who served as agriculture minister in both the provincial and federal governments of the time. The Belgian-style wheat ale has been brewed with Red Fife wheat, an historic strain that has been revived in recent years and is rarely used in beer making, as well as rhubarb juice from Living Sky Winery, an addition inspired by the fact that William Motherwell abstained from alcohol and preferred rhubarb tea. A preview firkin of this year’s edition of the beer will be tapped at Bushwakker this Friday August 17th at 5:30 PM, with representatives from the Motherwell Homestead on hand in period dress. The official launch will follow on Saturday August 25th at the Homestead as part of a day of celebrations that will include Threshing Day, a Field to Fork Festival, a Symphony Under The Sky performance by the Regina Symphony Orchestra, and more. For further details and ticket information, see the Events page on the Friends of Motherwell website.